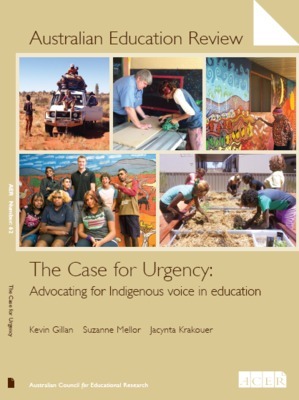 "The Case for Urgency: Advocating for Indigenous voice in education" by Kevin P. Gillan, Suzanne Mellor et al. Foreword by Mark Rose, Professor and Executive Director of Strategic Indigenous Strategy at La Trobe University. As a Gunditjmara man and scholar, he has spent 40 years working in education, contributing in a broad range of educational settings locally, nationally and internationally. In 2004 the Australian Council for Educational Research (ACER) published an Australian Education Review (AER) on Indigenous Education: The Case for Change: A review of contemporary research on Indigenous education outcomes, AER 47 (Mellor & Corrigan, 2004). In the 13 years since its publication, the state of Indigenous education outcomes has remained substantially unaltered. All the social indicators demonstrate that Australia’s First Nations people continue to be the most socio-economically disadvantaged population cohort in Australian society. This is after decades of continued policy efforts by successive Commonwealth, state and territory governments to ameliorate Indigenous education disadvantage. We still struggle with understanding how best to get Indigenous children to go to school, keep them in school, help them finish school and then go on to future education or employment. Despite the seemingly elementary nature of the problem, policy practitioners will be all too familiar with the complex nature of Indigenous education in Australia. Consequently, addressing Indigenous educational disadvantage attracts a multitude of solutions that manifest themselves as ever-changing policy approaches, often underpinned by ideology. The authors of this review paper argue that no one solution will remedy Indigenous social or educational disadvantage, but neither will policies premised on ideological views.